Lance Dunn (10) found the end zone three times against Illinois State. 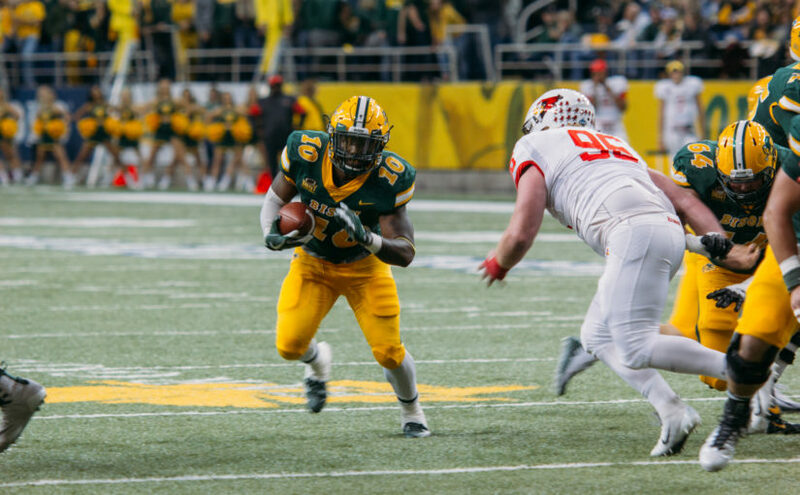 All eyes in FCS football were focused squarely on the Fargodome Saturday afternoon when the top-ranked North Dakota State Bison (7-0, 4-0) took on the seventh-ranked Illinois State Redbirds (5-2, 2-2) in a battle of Missouri Valley Football Conference heavyweights. The Bison knocked the Redbirds to the mat early and often en route to a 28-14 victory. The game got out of hand early, as the Bison took a 21-0 lead into halftime and put it on ice with a touchdown drive early in the third quarter. Quarterback Easton Stick and the Bison offense hit first. On third down deep in their own territory, Stick found wide receiver Darrius Shepherd streaking down the middle of the field, taking the ball all the way down to the Redbird 15-yard line. A 4-yard touchdown run two plays later by Lance Dunn put the Bison up 7-0. A quick three-and-out allowed the Bison offense to knock on the door again. Stick and Shepherd connected again, this time for 44 yards into the Redbirds’ red zone. An interception by Stick ended the drive, but the tone had been set. Shepherd again was the catalyst, as the first quarter came to a close, this time with a big punt return. The offense line for the Bison continued to push people around, as the run game began to churn out first downs. Dallas Freeman put the exclamation point on the drive, scoring on a jet sweep. The Redbirds seemingly found their footing now down two scores. Quarterback Brady Davis and running back James Robinson brought Illinois State into the Bison red zone. Facing third-and-goal from the 5-yard line, Davis initially rolled left, but was chased by a Bison defender. Forced back right, the Memphis transfer tossed an ill-advised throw toward the end zone. The pass found the hands of Bison safety Robbie Grimsley to keep a zero in the Redbirds’ score column. In traditional Bison fashion, NDSU marched down the field. Running plays on early-downs allowed the Bison to open the playbook to play action passes and deep drops, and Stick engineered a 95-yard drive, punctuated by another Lance Dunn touchdown. The Bison, and specifically Shepherd, continued their strong form. Shepherd’s excellent open-field running ability led to a 69-yard punt return, bringing his total yards for the game to 225. A short field for the Bison led to Lance Dunn’s third touchdown of the day, as any whiff of a potential Redbirds’ comeback disappeared. Some late chunk plays by Robinson, who finished the day with 128 yards on the ground, coupled with 112 yards receiving from Spencer Schnell, led to a couple Redbirds touchdowns, but the outcome was never in doubt. Fantastic performances from all three phases gave the Bison a 28-14 victory. This felt like a statement game for the Herd. They are here to stay atop the FCS food chain. The win on Sunday followed a familiar pattern in NDSU victories. Win the battle in the trenches, get the ball in Darius Shepherd’s hands and force a key turnover or two. Check, check and check. It also does not hurt having the loudest fans in college football screaming at the top of their lungs for four quarters. It was a day for the senior leaders of the Bison squad. Stick led the Bison with 74 rushing yards, as NDSU added a healthy dose of quarterback runs. Dunn led the backs with 61 yards on the ground and three scores in a backfield without Bruce Anderson, who sat out with a hamstring injury. But it was Shepherd who blew up the stat sheet. Despite not having a touchdown, the senior receiver totaled 236 of all-purpose yards. Defensively, Grimsley added a team-high 8 tackles and a sack. The senior safety led the charge as the Bison safeties and linebackers tried to keep Robinson and Davis in check. NDSU moved to 7-0 with the win and 4-0 in the Missouri Valley. Below the Bison in the Valley standings, teams keep trading blows. Only one other team boasts a record in the conference better than .500. Northern Iowa hold that solo 3-1 record after taking down South Dakota State Saturday. The Bison hit the road once again next week with a trip to Vermillion. South Dakota and the Bison kick off at 2 p.m. Saturday at the DakotaDome.